There has been a massive turn around in the fortunes of the Mayo hurlers in the past few months. Last year they could barely buy a win beating only Roscommon in both league and championship, albeit they pushed Kildare all the way in the opening round of the Christy Ring Cup and were drawn in the losers round against a Carlow side that nobody expected to be there. But since the start of the league campaign this year they have hit the ground running and not looked back. An opening day win against Donegal at home was followed up with wins on the road against Armagh and Derry, before they saw off Wicklow at home to book their place in this years league final. Last weekend they traveled to Portaferry for a dress rehearsal of this Sunday’s league final and manager Derek Walsh didn’t want to show his hand too early and made wholesale changes to the team from the one that had gone out the week previously and Down took the points to join Mayo in the final. In Cavan on Sunday Mayo created history in claiming the National Hurling League Division 2B title and with it promotion to division 2A for next year. 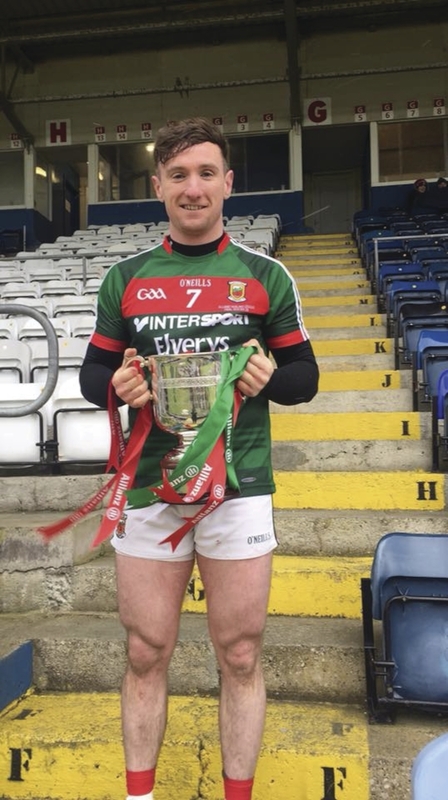 Kenny Feeney was the main man on the scoreboard for Mayo finishing up the day with an impressive haul of 0-11 for his name, with his free taking key to Mayo’s victory. Down had started the game the better and were leading 0-5 to 0-1 with 15 minutes gone in the game thanks to a brace of points from both Paul Sheehan and Daithi Sands, with Declan McManus getting the other with Feeney getting Mayo’s only score in the opening exchanges. But they began to find their feet and a brace of Feeney points along with one from Keith Higgins had the bare minimum between the teams as the 20 minute mark approached. Caolan Baile edged the Ulster men back in front by two as the half hour mark approached, and not long after Brian Morley was able to raise the green flag taking advantage of a mistake by Stephen Keith in the down goal. The Mourne county hit back with Paul Sheehan landing the scores to put his team into a slender 0-9 to 1-5 lead at the break. That lead was pushed out to two points early on in the second half, but Mayo really began to take over from there on in with with Feeney leading the charge along with scores from Higgins and captain Cathal Freeman to push themselves into a winning lead down the home straight. Mayo: Donal O’Brien; Daniel Huane, Conor Daly, Brian Hunt; Michael Morley, David Kenny, Cathal Freeman; Conor Henry, Kieran McDermott; Sean Regan, Kenny Feeney, Brian Morley; Shane Boland, Keith Higgins, Sean Mulory. Subs: Martin Parsons, John Cotter, Adrian Brennan, Corey Scahill, Donal McGreal, Conor Murray, Bobby Douglas, Darren McTigue, Sean Kenny, Jason Coyne, Tony Sweeney. *Mayo team and subs as per programme from match day. Page generated in 0.0798 seconds.